It’s late at night and the Whitman campus is deserted. Where are all the students? The library. Yes, the Penrose Library. Like many colleges, Whitman’s library is the intellectual heart of the campus. Unlike many, Whitman’s social center also is the library. And it’s open 24 hours a day. Seven days a week. 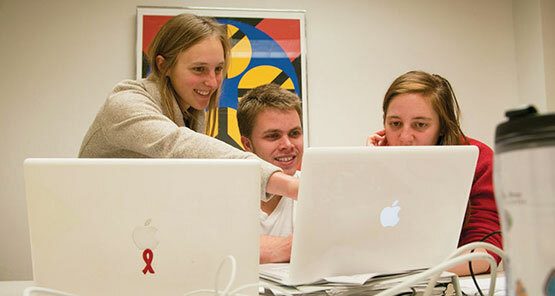 “Clearly there’s a little bit of nerd in all us students,” Emilie Gilbert ’13 said jokingly. If by nerd she means engaged in a variety of activities then she fits the description: Gilbert is a two-sport athlete, a stellar student and she leads campus tours for prospective students. But when it comes time to socialize, you can find Gilbert and her friends at the library. “We all go to the library. It’s not looked down upon at Whitman. It won’t kill your social status. But it’s not all social. We go there to study together,” Gilbert said. Whitties don’t compete against one another. Instead, they learn from each another. Camaraderie is endemic to Whitman. The perfect spot for this collaborative learning to unfold is the historic Penrose Library, renovated in 2000. While there is no monitoring the library’s noise level, Whitman students have created a silent sanctuary free of disturbances. It’s called the Allen Reading Room, a study spot so quiet students can hear the proverbial pin drop. And it has its own social aspect – the Allen Reading Room Challenge, where the last student to leave the peaceful room after studying into the wee hours of the night gets to write a personal message in the room’s logbook, no matter how flippant or intellectual the note. 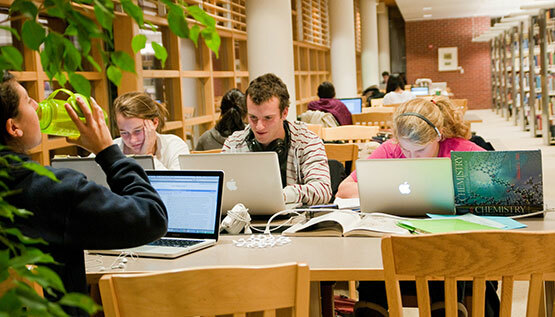 Aside from social networking, Whitman students flock to Penrose rather than remaining isolated in their residence hall, or interest-house room, because of the library’s resources. Perhaps the most valuable resource Penrose provides is people. 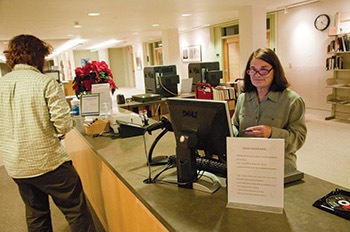 There are seven librarians working at Penrose, in addition to 13 regular staffers. Whitman students understand they have access to a powerful knowledge base and they take full advantage of the human capital, even in the age of ubiquitous search engines simply spitting out loads of information. “We help students sift through the lists and rank information because we know the quality resources that will meet students’ needs and help them succeed,” said Corkrum. In addition to the human element, the library’s digital archives have been undergoing a major transformation. Students’ honors theses are now scanned into the library repository. Whitman professors are getting in on the revolution, submitting articles and papers to be digitized. Penrose Library staff members have also scanned in the first 50 years of Whitman’s history, in terms of books, documents and photographs, as well as the first 50 years of Walla Walla’s history. In addition, the library has beefed up its databases for all academic disciplines humanities, social sciences and sciences. The library has fortified its databases and journal titles in order to help students and faculty further their scholarly research, to make connections between disciplines and to stay in tune with Whitman’s interdisciplinary and cross-disciplinary approaches. How does a student go about sifting through the library’s vast collections? For one, the library has implemented a state-of-the art search engine called “Watson” that enables students and professors to easily surf through data and mine the information they need.